For a bunch of Swedish dudes in tuxes, the Hives have done an excellent job keeping things lo-fi with the first video accompaniment to their forthcoming album, Lex Hives. The clip, for the extra repeaty “Go Right Ahead,” features almost fewer bells and whistles than the 30-second previews the band started dropping via their YouTube channel back in March. It’s set in a simple studio with a modest helping of curly ribbon décor (via Stereogum). It’s hard to remember another music video shot, in part, by iPhone cameras strapped to guitar headstocks, however. 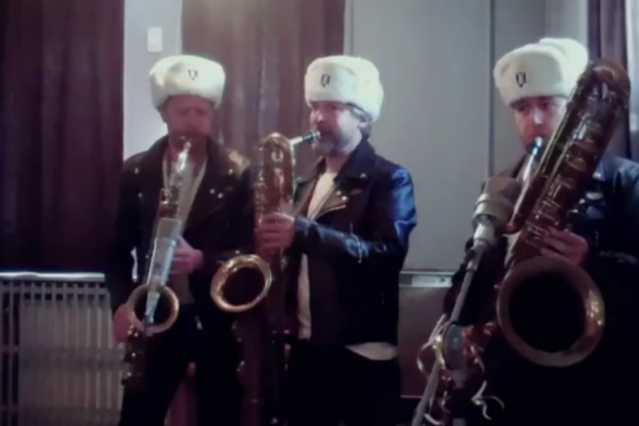 Also, check out that horn section! It’s worth noting, however, that this clip, though seemingly “live,” pales in comparison with the amazing things frontman Howlin’ Pelle Almqvist says at their shows, as well as with the the mariachi get-ups we’re disappointed they didn’t sport this time. Lex Hives, the band’s fifth studio effort, drops June 5 via their own label, Disques Hives.